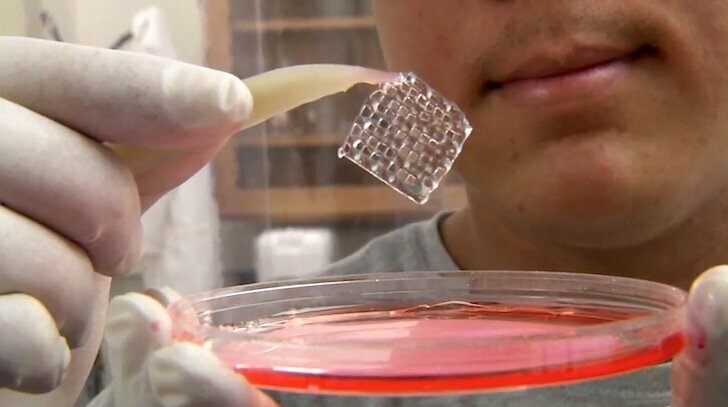 I hadn’t even heard of bioprinting before a few months ago, and since then it’s become one of the most recurring topics on this site. From stem cells, to ears and noses, and even work on printing solid organs; it’s an explosive industry inside the already exploding industry that is 3D printing. There are other ongoing efforts for printing organs too, specifically at the University of Iowa. Co-Directors Tim Marler and Ibrahim Ozbolat of the Advanced Manufacturing Technology (AMTecH) group at the University of Iowa College of Engineering’s Center for Computer Aided Design (CCAD) are working diligently on bioprinting human tissue. With a special two-arm 3D printer built by Howard Chen, a UI doctoral student in industrial engineering, two different substances can be printed in different patterns simultaneously. This gives UI researchers a unique advantage over those that are working with the typical single-arm bioprinters, and they’ve already had success with small blood vessels. The plans are to go far beyond that, though, as Ozbolat relates, “One of the most promising research activities is bioprinting a glucose-sensitive pancreatic organ that can be grown in a lab and transplanted anywhere inside the body to regulate the glucose level of blood.” While some diabetics will cringe at the thought of having a printed organ inside them, others will be delighted to be done with daily injections.